12 inch duct Backdraft Damper RSK4, spring loaded Fantech . Backdraft dampers prevent the unwanted flow of air into a house through exhaust ducts when the exhaust fan is off. 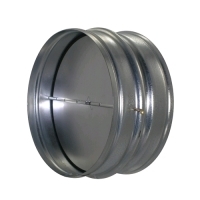 These sensitive spring-loaded backdraft dampers will accomplish this with minimal effect on the exhaust stream, while providing a good seal against backdrafts. . Spring loaded for positive closure.